TransMilenio in Bogotá, Colombia was launched as a short-term goal that was part of a long-term vision for urban improvement. Photo by Gerardo Arévalo Tamayo. Ricardo Sánchez, chief of ECLAC’s Infrastructure Services Unit, led the presentations. Sánchez focused explicitly on the role of transport and urban infrastructure development in reducing inequality in the region and stimulating economic and social development, neither of which can happen without the other. Infrastructure development as a tool for poverty reduction is something we have written about frequently. Transport infrastructure and more livable built environments can dramatically increase poor people’s access to economic opportunities. These benefits can be even more striking for the disabled poor. Unfortunately, as Sánchez pointed out, the “infrastructure gap” in transport persists. Policymakers in cities around the world continue to let urban infrastructure languish, even as demand for new infrastructure booms and despite the axiom that infrastructure development boosts economic productivity. Sánchez highlighted the main challenges to sustainable and inclusive urban infrastructure development in Latin America, which hold true in cities around the world. These include tightness in space or shortage in provision; inconsistent views among policymakers on best practices; institutional failures (e.g. cities that rely on one agency to plan housing, another to govern the streets, and still others to govern transportation); and a lack of sustainability criteria in infrastructure design policies, a weakness that Sánchez suggests is particularly glaring in transport and worse in landlocked countries. But increasingly best practices are standing out and becoming more difficult for policymakers to ignore. The U.N./Columbia publication highlights six of them. Policymakers should lead the change, as Jaime Lerner did in Curitiba with his commitment to transforming public transportation in the city. Curitiba’s bus rapid transit (BRT) system continues to serve as a global model. Policymakers must also bridge the gap, linking short-term goals to a long-term vision for urban improvement. 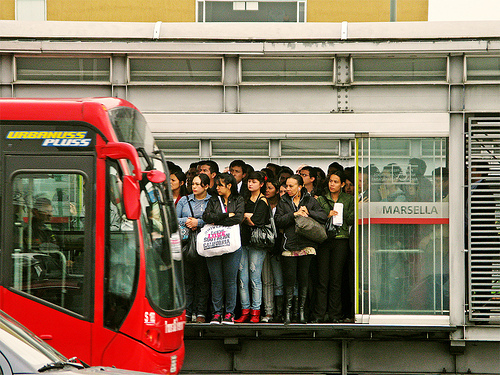 Bogotá’s successful implementation of its BRT system, TransMilenio, can serve as an example. As EMBARQ Senior Transport Engineer Dario Hidalgo points out, Mayor Enrique Peñalosa started the project from scratch and then seamlessly passed it on to the next administration. The third guiding principle is to integrate sectors, actors and institutions. Think of the city as a living organism, where the contribution of each unique part is crucial for the organism to thrive. The fourth and fifth guiding principles focus on the financial phenomena that penetrate all urban ecosystems: leaders must recognize the value of sustainable infrastructure, and incentivize it appropriately, while pursuing policies that turn sustainable development into a profitable business opportunity. And finally, the principle that we began with: build a city for the people, by the people. Public-private partnerships like Atal Indore City Transport Services Ltd (AICTSL) in Indore, one of India’s fastest growing cities, are emerging as a crucial tool to promote transparency and include more stakeholders in the urban planning process. Ricardo Jordán and Willard Phillips closed the session, again citing social inclusion and poverty reduction as a central aim for urban planners. Jordán emphasized the urgency of making the correct choices today, which governments can encourage by creating appropriate incentives. Examples could include identifying economic losses from congestion and implementing congestion pricing; providing reward mechanisms for non-polluting companies; and removing “wicked” subsidies for fuel and subsidizing research and development for sustainability, instead. Phillips, who is the economic affairs officer heading the Caribbean regional office, then spoke of the challenges particular to the Caribbean region, which we can easily overlook when considering urban development in a global context. Extremely high population density on tiny Caribbean islands means any developments will happen in someone’s – and likely a lot of people’s – “back yard,” aggravating spatial and political challenges at once. Also, for these service-dependent economies, a focus on international transport is much more crucial than in larger nations, yet too much focus on tourism fosters economic development enclaves rather than socially inclusive development. Phillips’s speech reminded us of the need to contextualize any best practice for every region, country and city.